Last Friday I was off work having to wait for the telco people to come and install the fibre internet broadband. Early in the week I had decided what I wanted to cook for dinner, teriyaki chicken and steamed egg. 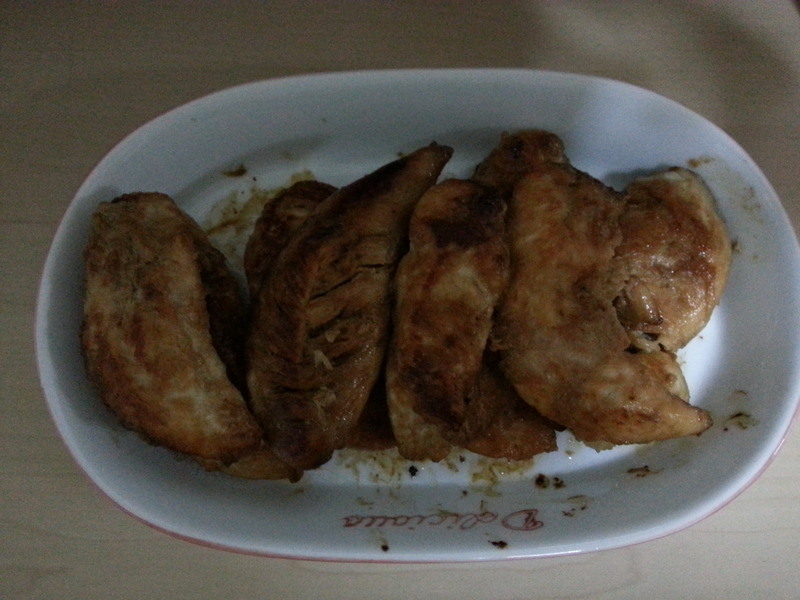 I woke up early (internal alarm clock wouldn’t let me sleep in 😦 ) and prepared the chicken by marinating the fillets in teriyaki sauce made from scratch (recipe found here: http://japanesefood.about.com/od/teriyakisauce/r/teriyakichicken.htm). 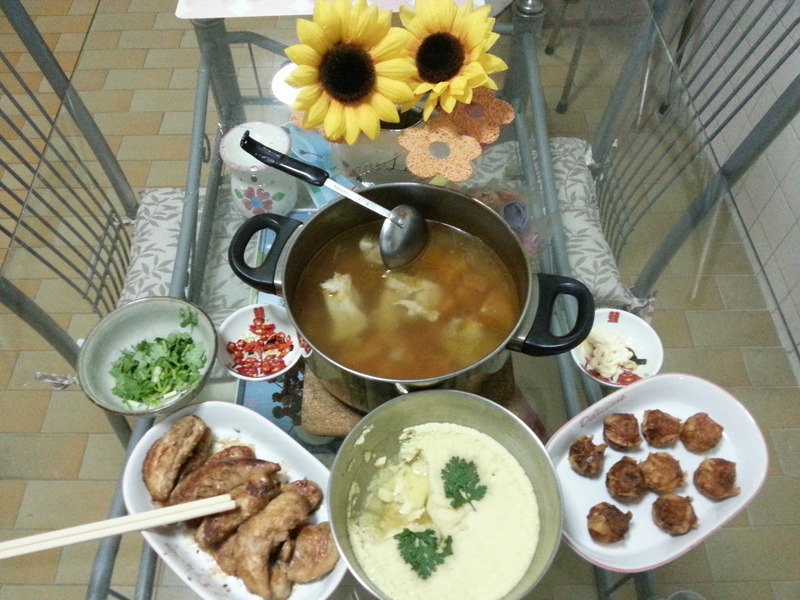 I had the shrimps shelled, de-veined and cut into small pieces, and the pork ribs soup with carrots and onions cooked before noon. 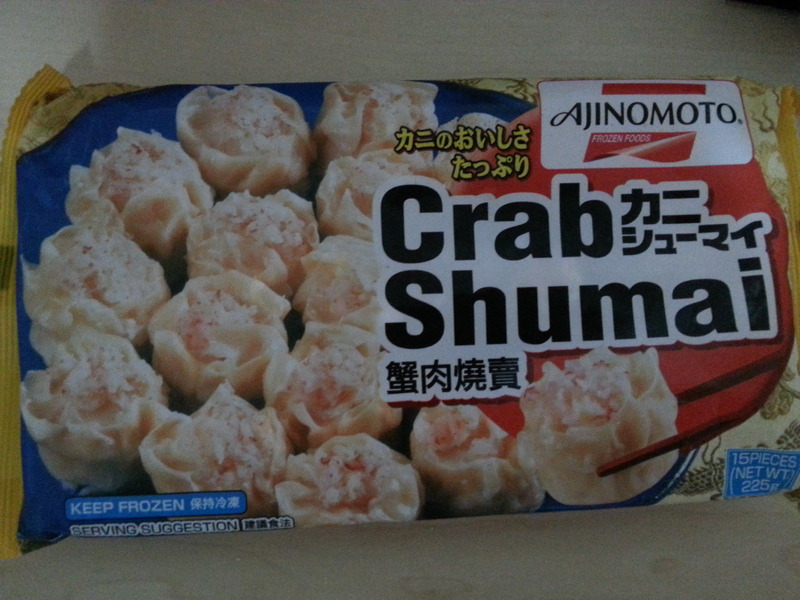 Had to do a last-minute shopping with Mel for the frozen crab meat siu-mai that she requested for dinner. While waiting for the telco man to come and configure the wireless modem and router, Mel and I lazed on the sofa, she talking about her favourite K-pop artists, me brainwashing (well, trying to) her with bits of info about Il Divo. And while I had An Evening With Il Divo playing on the tv, she had Korean drama playing on her laptop. 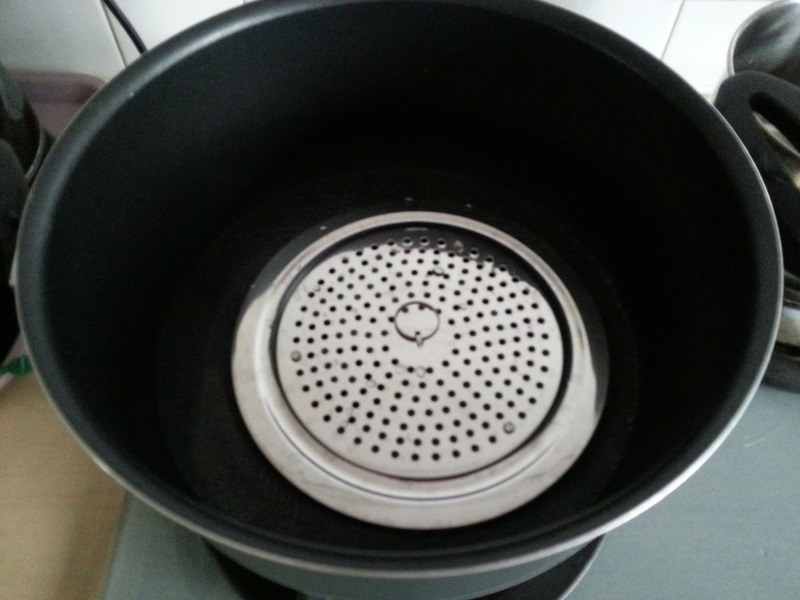 It went on till it was time to prepare for dinner. Teriyaki Chicken – I should’ve used chicken thighs with skin but couldn’t find the boneless ones so I bought fillets instead. Doesn’t look like the real deal but it tasted ok for first try 😛 Picture is a little dark because my phone had almost run out of battery, couldn’t use flash. 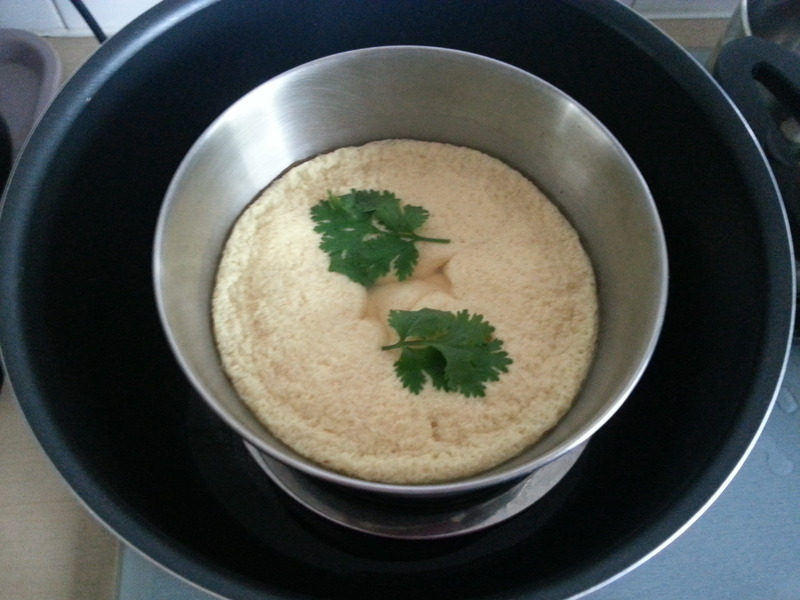 The sauce (marinade) was dried up by the Happy Call pan so next time I’ll just use the saucepan instead. 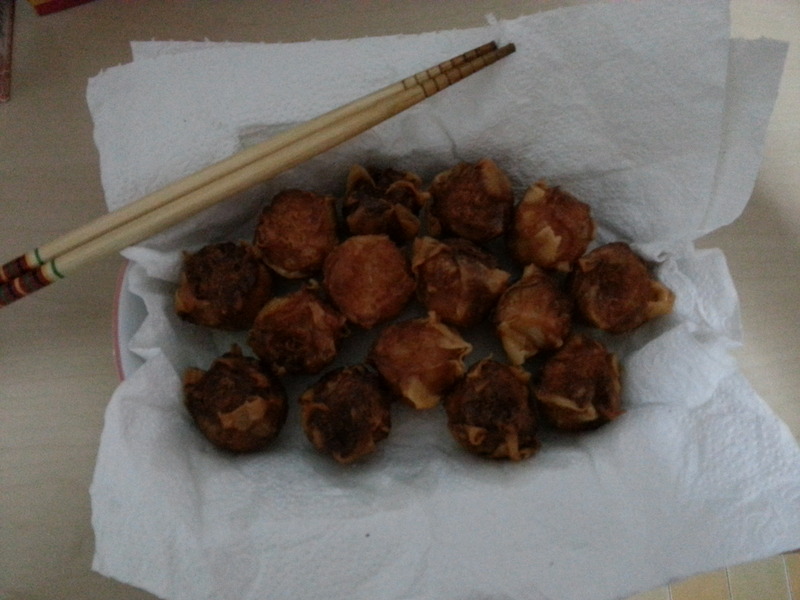 The Deep-Fried Siu-Mai’s – could’ve steamed or micro-waved it, but Mel said deep-fried is nice when dipped in Japanese Mayonnaise. 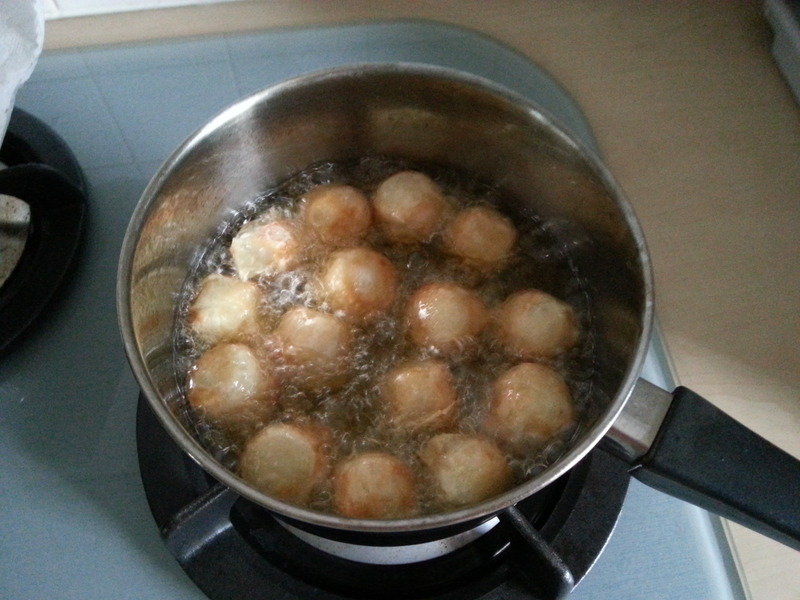 I guess I didn’t know what ‘fry until golden brown’ means cos I fried until they turned almost black 😛 They were very stubborn, refusing to turn over, leaving their backsides white. I flipped them over, they turned their backsides at me again. How rude! It was a battle to get both sides tanned, that was why some of them turned darker than the others…I was too engrossed in my fight with them to notice some of them had almost burnt LOL (serves them right!) Btw, that’s a pair of super long chopsticks for frying, allows you to keep your hand far away from the splattering oil. Umm…could it be that I’m a darn good…photographer? LOL! The food looks really yummy – much better than my banana! 😛 You’re making me hungry! I still don’t understand the egg process though. Yes, I’m blonde. LOL. I know you are patiently trying to explain it to me, so thank you. 🙂 You did really good for ‘not being much of a cook’! Julia Child’s would be proud. 🙂 Can you fly me over on your jet next time? Looks wery upscale to me. You did great girl!